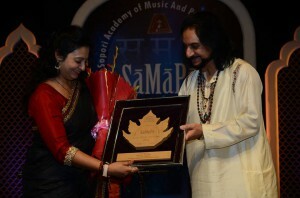 Meeta Pandit, the scion of the Gwalior Gharana, was conferred the ‘SaMaPa Yuva Ratan’ award for her contribution to Hindustani Classical Music (Vocal). The award was presented by Santoor maestro Pandit Bhajan Sopori’s Academy of Music And Performing Arts (SaMaPa) in New Delhi on 20th November, 2015. The 3 day festival, held from 20-22th November, 2015, featured noted musicians including Pandit Bhajan Sopori, Pandit Vishwa Mohan Bhatt, Ustad Hashmat Ali Khan, Ustad Iqbal Ahmed Khan, Sali Bhatt and Akram Khan, among others.